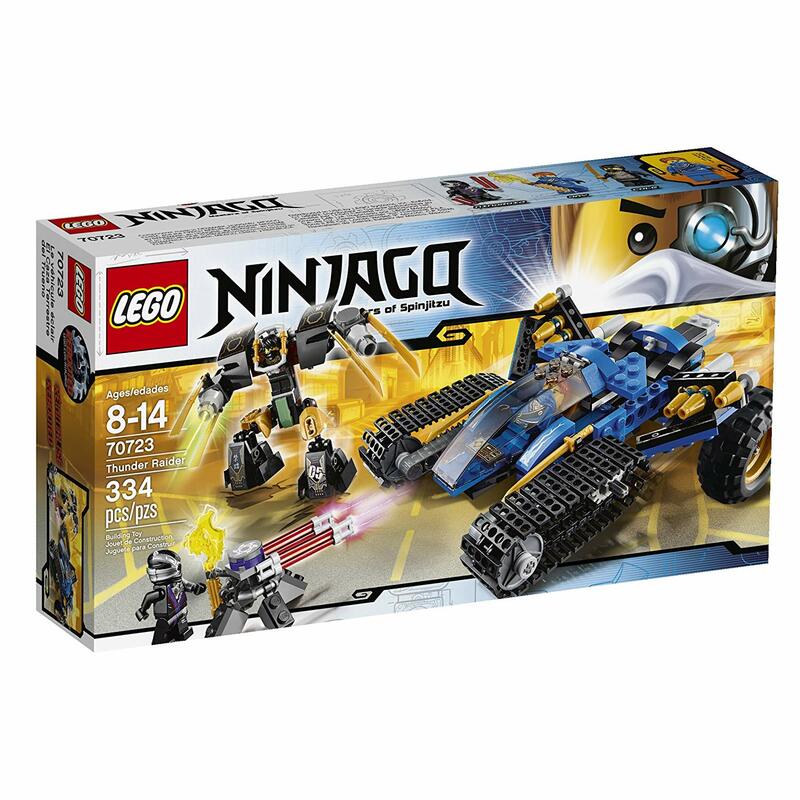 The Thunder Raider is one of the 2014 Ninjago sets released in January. It contains 334 pieces and retails for $29.99. You can purchase the set on Amazon. You can also see a previous review of this set by Chris. This is a solid set both for parts and playability. The mech is the best feature of this set, having a simple and elegant design. The vehicle on the other hand looks a bit messy with the haphazard array of blue plates, but it plays well and features a transforming attack mode and the ability to carry the mech. Parts-wise, there’s a wide selection of elements including new ones like the black vehicle spoiler and A-frame wedges. Even though I recommend buying individual parts on Bricklink, sometimes it’s good to buy sets when you there’s not a specific piece you’re looking for and just want to expand the variety of your collection. This is a great set for that purpose. The CON is a matter of opinion. We purchased this set specifically because of the design of the vehicle and the smooth action on the treads is truly fantastic. Maybe check yourself when offering opinion of reviews in place of facts regarding the stoutness of the build, its playability and pieces included. Buffalorand: I think you may mistake the nature of a review, or certainly the reviews on this site. The facts of the model can, for the most part, be ascertained simply from reading the box or flipping through the inventory or instructions online, and therefore are provided in our reviews simply as a quick reference. You don’t need us to tell you how many pieces are in a set. Instead, a review provides the perspective of the reviewer, which by necessity incorporates opinions (even matters such as stoutness and playability are opinions, not facts). The opinions provided by the reviewer serve to get the reader thinking about aspects of the set that he or she may have not previously noticed, and in some measure to provide a knowledgeable guide. It’s perfectly fine to disagree with the reviewer and his or her opinions. Use them instead as a segue to forming your own opinions. I could not disagree more with the follow-up comments. The purpose of a review is to get perspective of something’s over-all worthiness for the price point or quality. Movies, Automobiles, appliances etc. Opinion is not to be taken into account lest the review be considered biased and therefor not valid to a mass audience. I didn’t mention piece count at all. New pieces or rare pieces, colors, new building techniques; these things should be at the forefront for the consumer review. I can do math and figure the price per piece in the LEGO Store. I can not know the pieces included in the set by perusing the instructions unless I purchase the item first. I rarely read a review for the reviewer’s opinion about subjective matters. Why bother unless the person is of a similar disposition to me? Stoutness and playability certainly are not opinion if the item has major design flaws. Many LEGO sets are redesigned for this reason (want a list?). A review of a LEGO set is very valuable but including in the reasons to not purchase something is ‘I just don’t like the way it looks’ should be part of the review but not necessarily included in reasons not to purchase. Too often I am left wanting from reviews at TBB. This review just got my dander up because I feel the vehicle especially looks pretty darn cool and if someone asks (and many have) I will tell them to get this set for its over all fantastic design concepts. In my opinion, the small mech leaves much to be desired as it uses too many Hero Factory elements. But, again, that is opinion. Buffalorand: I am sorry that you have not found our reviews to be to your taste. A great many professional reviews discuss subjective matters, and we will not shy away from that. Again, use our opinions as a pathway to forming your own: we don’t demand that you agree with us. In fact, if you disagree with our assessment, it may provide for you a catalyst for deeper thinking about the set and why you like/dislike it, which can provide valuable insight for future purchases. @Buffalorand – I disagree. Reviews are often matters of opinion. Car reviews, movie reviews, book reviews, reviews of restaurants are all generally opinions and little more. The reason that you, yourself, reads a review may be “to get perspective of something’s over-all worthiness for the price point or quality” but that is not universal. Many sites do reviews of Lego sets. Some do total breakdowns and show you every piece. Some give their opinions of the sets and their design. Both styles are “reviews” and it is up to each reader to decide which they prefer. If you are “left wanting” by the reviews here, you can probably find reviews more to your liking on other sites. Our reviews are purposefully different as there is no need for us to recreate the reviews that other sites are doing. Our philosophy is that the Lego fan sites should complement each other, when possible, rather than post the exact same information in their reviews. Stoutness and Playability are definitely matters of opinion. The degree of stoutness totally depends on what is being built. For example, a solid block of 2×4 bricks, 1 foot square, would be stout by anyone’s standards but where the line is drawn for vehicles is quite subjective. What I consider stout and what you consider stout are probably two completely different things. Playability is even more subjective. What age range are we talking about? Are we talking about play features only or is swooshability an issue? You said that you “can not know the pieces included in the set by perusing the instructions unless I purchase the item first”. This is simply incorrect. Bricklink often has set inventories up immediately upon the set being released and Lego itself usually posts the building instructions on their site. You corrected Chris saying that “I didn’t mention piece count at all”. You did say that a review should talk about the pieces included in the set. To me that would include mention of piece count. ..it doesn’t look very appealing because there are too many exposed studs. Just a thought. Don’t just give the opinion, but explain the reasoning behind that opinion too.